Consider how the movement of a meme across the social media landscape spreads what looks good on the surface, but is fetid logic underneath. A few months back I spoke at Social Media Breakfast, Seattle about Social Media, Lean and the CIA. A big part of that talk covered the danger of companies assuming that merely listening to people through Twitter was a standard of success. Now let me tell you a little story about a recent experience I had with Delta Airlines, and how it relates to Chris Brogan's quote regarding assumptions on the Internet. I was flying back to Seattle from Viet Nam. I had a ticket, but no seat assignment on the leg from Tokyo to Seattle. I was told that this wasn’t a problem, I could get one when I checked in at the desk in Tokyo. My layover in Tokyo was nearly 10 hours long, before my 10 hour flight back to the States. No problem, I thought. I would quickly check in, and then enjoy the day exploring the city. I wend my way through the intricacies of Narita Airport, finally finding the transfer desk. It was unmanned. It was about 7 am at this point, so I went to the information counter and asked when the Delta people came to work. Well, that’s pretty inconvenient. But I got myself some breakfast and proceeded to wait. 11:30 came and went, and yet there was still no one at the Delta transfer desk. A little after noon the desk finally opened. It took 15 minutes for them to process my request, after which they informed me I would get my boarding pass and seat assignment 15 minutes before departure. I inquired why, and was told my ticket was so cheap I didn’t get a seat assignment. I said that this was leg four of a ticket that went from Paris to Beijing to Hanoi to Tokyo to Seattle and all the other legs had seat assignments. At that point I was told tersely that I simply didn’t have a seat assignment. “Okay, how do I avoid having this happen in the future?” I asked. I got my papers pushed back at me and never did receive an answer. I have no idea how to make sure this doesn’t happen next time. So, I’m stuck in Narita for 10 hours now because I need to make sure that the moment they open the gate, I’m first in line for a seat assignment. I do what any red blooded netizen would do. I tweet that I’m annoyed with Delta. And so I DMed them. Now…look up. My story wasn’t short. But I had to mash it into several 140 character statements because Delta didn’t actually give me a higher bandwidth way to have the conversation. I told them the fastest possible version of that story. Without any further communication, Delta gave me 2,500 frequent flier points. I don’t even fly Delta! This was pretty much the equivalent of Charlie Brown winning 5 free haircuts. “My dad’s a barber and besides, I don’t have that much hair to cut!” he lamented. Delta’s ears might have been big, but their execution sucked. No, their listening is not what I will remember them for, but rather, it is their consolation prize I will forever associate them with. I still have no idea how to not get stuck somewhere waiting for a seat assignment. That was all I really wanted: simple information. What should Delta have done? Let me now share a story from an earlier part of that trip. Due to a communication snafu, Orbitz messed up part of my flight. At one point, I was in real danger of being stuck in Paris with no way to fly onto to Hanoi or, to return home. I tweeted my frustration and Orbitz responded within minutes. They immediately gave me a direct email address and a phone number to Kristi, a real person, who could help (and who could take the time to get the whole story). Orbitz then fixed the problem I had and one other I didn’t know I had. Then they told me how I could avoid having that ever happen to me again. Orbitz had big ears, but more importantly, they also had helping hands. Delta’s system is built on productivity. They feel they did a good job by moving me through their process and giving me something. Orbitz is build on effectiveness. (I cover the difference in this post). They found the real problem, solved it, and made sure I was taken care of. Rest assured, both experiences will have a lasting impact. Imagine Yo-Yo Ma performing a solo. Now imagine him performing a duet with Hai-Ye Ni. Now imagine him performing the duet on his own. First he’ll play his part, then he’ll play hers. Sure it’ll take twice as long … but he’ll get there. I've never been more productive than I've been over the past year. This was not due to a tool. It was not due to Personal Kanban. It was not due to energy drinks or hot yoga. It was due to the powerful combination of collaboration and clarity. Everything that was successful about 2009 I attribute to the potency of these two forces. Anything that fell short, can be easily traced to a lack of it. Tonianne first came on board with Modus to help me write my book. During the first six months of the year, we pounded out about 80% of a fairly decent manuscript. We felt really good about this, but we were just getting our sea legs. It wasn’t until June when we raised the sails and the effortless race began. and I know I’m forgetting things. The UN Work and the World Bank project have shown me that David Anderson and I shouldn’t have been surprised when he used Kanban at Corbis and achieved 400%+ gains in productivity. We should have expected it. Collaboration and clarity through the kanban dictated it. There were only two projects that Tonianne and I worked on this year that we were less than pleased with, and that is due to a lack of collaboration and clarity. Engagements where people lacked clear understanding of their role in the project or the purpose of the project or the direction of the project led to collaboration breakdown and failure. The World Bank/CGIAR project was a wake up call. The group we worked with was comprised of people from around the world, all dedicated professionals, all very intelligent. Previously, the project was all but paralyzed. We got them in a room and working and together they took off. Vertical take off. They went from almost nothing to a clear concept of purpose and a tremendous amount of documentation in five days. Why? Because in that conference room they had clarity and they were able to collaborate. And they did it gleefully. Why didn’t they do this before? No clarity and no feeling of collaborative momentum. They had jobs in their isolated offices and this project (no matter how important or interesting) was just another thing begging for attention during the course of their day. The UN Project showed me that collaboration and clarity can be effortless in a distributed team as well. One of the lessons we are writing is in a module where other lessons are being written by Nancy White and John Smith. Instantly and elegantly, everyone began collaborating organically, which has made our work much easier. Our individual creativity and expertise is providing immediate quality improvements to our respective sections and the document as a whole. So, if Tonianne and I can do all that in six months, and if David can get a 400%+ rise in team productivity, what does this mean? That with a team that has clarity, the number of team members does not necessarily provide linear gains in productivity. I’m not saying it’s exponential. I’m just saying that 1+1 > 2. Now imagine him performing the duet on his own. First he’ll play his part, then he’ll play hers. It’ll take twice as long … but he’ll get there. Life cannot be a solo. Ma and Ni are two of the most accomplished cellists in history, but they can’t perform a duet on their own. Their art, their accomplishment, comes from knowing when they are soloing and when they are part of something larger than themselves. This does not mean they lose themselves in the process. They don’t become cello-bots simply because it’s not their solo. When Yo-Yo falls back and Hai-Ye’s part is in the forefront, he’s playing his piece with the same grace and attentiveness as if he were on stage alone. Grace and attentiveness that comes from clarity is the bedrock of successful collaboration. You know your part, you know your place, you feel the whole being created because - and only because - you are playing your part perfectly. As for 2008, I just wanted it to end. It was a year plagued by muddy thinking, half-completed projects, and soloists trying to collaborate. 2008 physically hurt. 2009’s successes have existed not only because Tonianne’s and my duet was able to operate on its own, but also because that same duet could easily shift and become part of an even larger entity, like our UN quartet and CGIAR’s 14 piece orchestra. I want to thank Tonianne and those who truly understood Modus’ mission, helped make Personal Kanban what it has become, and prepared us for what looks to be a stunning 2010. Thank you all for this year. 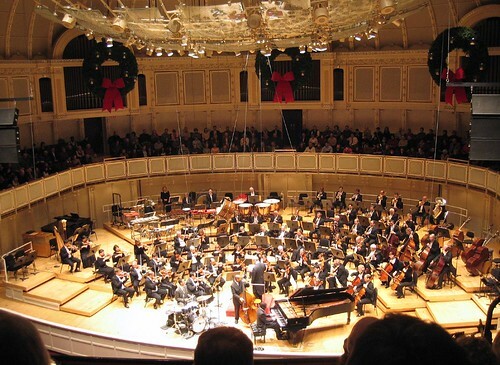 Photo of the Chicago Symphony Orchestra by Jordan Fischer. When I began to write a succession of posts on personal kanban back in July, I thought a few people might benefit from the idea. I never expected that the series would attract tens of thousands of viewers to my blog, Evolving Web. Less than two months later, there is a growing and enthusiastic personal kanban community which has been posting photos, discussing innovations, and advancing the meme. In a few short weeks, the community grew large enough to support a dedicated web site. So I am pleased to formally announce the launch of personalkanban.com, a blog and resource for personal kanban. Already, about a dozen guest posters and regular contributors have stepped forward to take the meme and run with it. Those of you who have been reading Evolving Web for a while know I’m all about community, process, and collaboration. Seeing this community form, that it’s based on a lightweight personal process, and that collaboration is already taking place is therefore an awesome birthday present for me this year. Please give the personalkanban.com a visit and subscribe to the feed. If you have personal kanaban stories to tell, please e-mail me at jim !at! soundbag !dot! com. The community would greatly benefit from your experiences and writing. Years ago, I was sitting in a very posh restaurant in San Francisco’s Mission District with a friend of mine. He was a very wealthy programmer, working for an incredibly prestigious financial company. We were talking, eating, laughing and having a wonderful evening overall. He looked up at me and told me he was going to go back on drugs. About 7 years previous, he had kicked heroin. He’d gone from shooting up in dirty houses to having a comfortable townhome in Noe Valley. He’d built a lot in a very short period of time. While giving me his reasoned rationale for wanting to go back onto heavy drugs he said, “I’m just not happy now. With everything I’ve achieved I’m just never happy. When I was using, I was happy for very short periods of time. I want to be happy again.” By the time I left him that night and went back to my hotel, he’d already scored and started his slide back to his previous life. Within a few months, he lost everything he’d worked for. Happiness is elusive. We chase it, we want it. Life seemingly conspires against it. We mask our need for it by watching sitcoms that make us smile for very short periods of time – the over-the-counter version of heroin. Over the last few years, I’ve met a long string of people who have gone through the 80s and 90s and now almost all of the aughts and have come up empty. Whether they have money or not, whether the recession is felt by them or not, there is a measurable exodus from lifestyles that fundamentally work at cross-purposes to happiness. Thankfully, very few of them see drugs as an acceptable solution. This isn’t drop-out happiness people are seeking. No communes, no great-american-novels, no buy-a-wineries (well, okay, two people bought wineries)…. This movement to happiness is pragmatic. People understand that they are better family members, they are healthier, they can help others more, they are more productive team members, etc. when they are happy. So .. why not be happy? Happiness is a construct and a really ethereal one at that. It is often confused with states it is very similar to like gratification, placation, contentment, etc. Happiness can be self-serving or it can be effacing and humble. As managers or business owners or team members, we ignore happiness at our peril. Why? Because there appears to be a tacit assumption that work and happiness don’t go together. Happiness comes later. When I retire, when I can take vacation, when I’m … not .. at …work. Submission to genetic programming can become quite dangerous because it leaves us helpless. A person who cannot override genetic instructions when necessary is always vulnerable. …. A thoroughly socialized person is one who desires only the rewards that others around him have agreed he should long for – rewards often grafted onto genetically programmed desires. He may encounter thousands of potentially fulfilling experiences, but he fails to notice them because they are not the things he desires. Professional fulfillment is part of happiness. It has to be. We all know it. So, if we’re setting up a team for a project, why not have happiness be a primary goal of the team’s infrastructure? Maybe even THE goal. Product second, remuneration third. Happiness first. After reading about our endless quest for happiness by neuroscientists, orchestra conductors, Buddhist monks, psychologists, philosophers, humorists, management theorists, and everyone in-between, I’ve come to one conclusion. People are happy when they know what they’re doing and aren’t offended by it. There are very few reasons why we would ever do something we were offended by or without cause. At work, people feel obligated to do what their employer requests – even if they find it offensive, demeaning or perplexing. Depending on their situations, they may feel that they have no choice but to do as requested – with even quitting being out of the question. Unenlightened employers may feel this is a position of power and rejoice in the entrapment of such people. However, if your goal is to have a business that grows and innovates – this mindset is not going to help you. Business cultures that strike a balance between business and personal health should engender a happier workforce. People worry a great deal about what happens at the office. They take that stress home with them. That stress can negatively impact home life. This creates more stress, which is in turn brought back to the office. In 2001, the Seattle Mariners won 116 games, tying the all time record for wins in a single season. They were mostly the same team they were the year before and the next year when their records were nowhere close to 116. In 2008, the Tampa Bay Rays went to the World Series after being dead last in 2007. Again, with roughly the same line up. There is an attitude of winning that can float or sink a team. If your team is committed to being happy first, its chances of winning will be bolstered. True commitment to a healthy culture creates momentum. In your professional life, there may be other people you have to be in touch with and work with. You may be working as a team to make a film, design a produce, or complete another kind of project. Each person on your team has his own difficulties , his own suffering. but because you are open, happy, fresh, and concentrated, you can help all of them touch their freshness. you don’t care only about their work performance, because the quality of their work depends on the peace and well-being inside each of them. You come to the business as a friend, helping everyone transform, bringing peace, harmony and well-being into their lives at home and at work. Yes, Master Hahn is a bit beyond what HR might be comfortable with. The point, however, is that teams made up of happy and psychologically healthy individuals understand that they are working with other human beings. We are working with people who have lives outside of work and that they are living inside work too. We are still alive while we’re at work. We aren’t purchased work-robots who have deferred our dreams to times of not-work. We have goals and, more often than not, those goals are good for the company. We want to complete projects. We want to understand the flow of work. We want to do what we can. In Flow, Csikszentmihalyi’s description of what makes people feel happiness is very much in-line with understanding your company’s value-stream. While there’s deeper issues at play, from a work perspective the value stream is vital. Understanding the flow of work through your organization satisfies some basic needs to making your workforce happy. Creating a lucid value stream and expressing people’s places in it gives workers a lot of power. They can optimize their place in the value stream based on their current skills or skills they wish to acquire. They can optimize the value stream itself by pointing out areas of improvement. In short, the clarity provided by understanding what the heck is going on is instantly gratifying. What is also interesting is, happiness as described by most of these authors is not a static state. Happiness is, rather, an aesthetic or an amalgam. The word happiness is used to indicate at least three related things, which we might roughly call emotional happiness, moral happiness and judgmental happiness. When all these authors get down to it, they end up describing self-rewarding systems that seem to result in rolling series of Maslovian peak experiences. Business then, which is loathe to really get into matters of personal mental health, can actually do a few things here. 1. Make business explicit to those doing the work. The value stream, the fiscal health of the company, people’s roles in the organization, corporate ethics and goals – should all be made explicit so workers can choose to improve, innovate, and participate. Free your managers and you from top down decision making. Give people the freedom to do their jobs. The fastest way to threaten anyone is to withhold information from them. Want to kill productivity? Keep secrets. The goal of work is to create things. Rewarding people for creating things is a healthy game. Avoid zero-sum games like promotions or winner-take-all prizes. Incentivize your value stream and not end-goals. Happiness is not fluff and it’s not a “nice to have”. It’s a central component to a functional team. Put a little thought into it and see what you come up with. During the Clinton Administration, I had the good fortune to be a certified National ITS Architecture expert. That meant I could travel around and help local, state and regional governments build their regional Intelligent Transportation Systems architectures. At the center of this was a cooperative element: regions needed a cooperative regional architecture that had at least a modicum of information sharing in order to get federal ITS dollars. It worked like a charm. I saw regions that previously and pervasively were at each others’ throats come together to create partnerships. When the Clintonian soft-fuzzy handcuffs were taken away by the subsequent administration, many of these partnerships predictably fell apart. Why? Because it’s hard to collaborate in a combative environment. Policy, in corporations or business, isn’t a neutered word. Vision, policy, and culture are often as easy as stating an intent and then putting some good rules behind it. For Clinton, it was to make money contingent on good regional collaborative governance. For the Obama administration, it is transparency, collaboration and participation. The stimulus package has ample hooks in it to support these goals. Introspection: Government and the public will become less hostile because information and respect is now a currency. Cost Cutting: Procurement inefficiencies, poorly understood value streams and duplication of effort will become much more visible and less tolerated. Grumbling, Bitching and Contention: Yay! When you discuss some things they can really annoy you. Government is huge and it does a whole lot. If you think you are annoyed at some of the policies of the company you work for … well, this is going to be like working for 30,000 companies simultaneously. Prepare to have an opinion and for others to have one too. In short, it’s politics! Does Grumbling negate Introspection? Nope. Collaboration isn’t easy, especially in a political world with hundreds of years of historic drama. We are bringing in as many people as want to participate, many of whom have felt disenfranchised, have agendas of their own, and are generally undereducated about what they are complaining about. Today’s communications technology gives us a new and unique ability to have an actual participatory democracy. Recent advances have led people to gravitate to camps of like-minded individuals, creating camps of group think and spin-up. This is natural. Government 2.0 initiatives could well be the place where people of differing opinions can come and have good and vital conversations. Whether Government 2.0 sites will have the savvy community management to foster productive conversation remains to be seen.